E no Genten was published in English as Origin of E in VIZ Media's digital Weekly Shonen Jump. 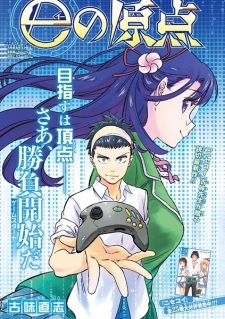 From the same author who wrote "Tokidoki", one of the best one-shots I've read, comes "E no Genten", a fresh new story which focuses on eSports. If you're here for the drama, I wouldn't say this is as good as Tokidoki, so you may want not enjoy it as much. But still, you can give it a try. Pretty predictable, but I still liked it. Compared to Tokidoki, it's not as good, but since it's just a one-shot I must say it was pretty well executed. BUT this does have a better ending, I guess. I was pretty surprised that Takumi, the male MC, didn't know about eSports at all. Very good art, one of my favourite styles. Fits well with the story and detailed as well. Good character development, considering this is a one-shot. Onodera fans... One of the characters, Satsuki Minahara, is the spitting image of her (except the hair colour), so you might want to check this out just for that. Just saying. The other character, Takumi, is a game-lover who doesn't seem to care about his future, but of course that changes with Minahara coming in. His strong determination was pretty appealing, especially since games is the only thing he's good at. If you've got some time left and you don't want to start a long series, read this. You won't regret it. Loved it. Hopefully Naoshi Komi does more works like these.